After facing flak for years over performance and price, the American stealth fighter is finally shot down. However, its replacement seems to be just as dubious. The US Defence Department announced Tuesday it would "most certainly" kill the troubled F-35 'stealth' fighter after getting final clearance from Secretary of Defence Ash Carter. With $1 trillion already sunk into development and initial production, the F-35 Joint Strike Fighter programme is known as the aircraft that's "more expensive than Australia". Initial reports suggest the decision to terminate the largest defence contract in history was a result of the threat from advanced versions of the Russian Su-27 Flanker series aircraft. "We just can't overlook the fact that in every wargamed scenario the Flankers have whipped the F-35," Pentagon spokesman Siphon Cash told USA Today. "Even without being stealthy, the Flankers are getting better with each new model." The impending arrival of the T-50 Sukhoi stealth fighter could be another reason. In a worrying trend, several American fighter pilots have taken early retirement even as the Russians have started inducting early models of their fifth generation fighter. "My father, a former USAF fighter pilot in the early 1970s, was spooked by the MiG-25 Foxbat and spent years in rehab," said John Kwitter, who was an F-35 pilot at Elgin Air Force Base, Florida. "The Foxbat was a big scare word in the USAF those days and rattled many pilots of my father's generation. With the F-35 likely to be a sitting duck for the Russian fighter jocks flying the T-50, I have decided not to end up in a mental asylum." Not everyone agreed the F-35 was a flying lemon. According to Democratic Party Senator Andrew McLaiyyer, “I will strangle any Johnny-come-lately who cancels our most patriotic military programme," he said while putting his signature to a Congressional bill that cuts spending on education, healthcare and food stamps. "The F-35 has some niggles which can be easily removed with further development," he told the US government mouthpiece, The Washington Post. "It's only a matter of time before they fix these issues." Sen McLaiyyer refused to comment on speculation that his sustained enthusiasm for the F-35 was owing to his state Florida hosting the most number of F-35 bases. He quickly walked away when asked if reports claiming he was supplied female escorts in Las Vegas by a USAF subcontractor were true. Over in Bethesda, Maryland, Lockheed-Martin, the aircraft's developer, was in firefighting mode and said it was working on a new engine that would run on water. 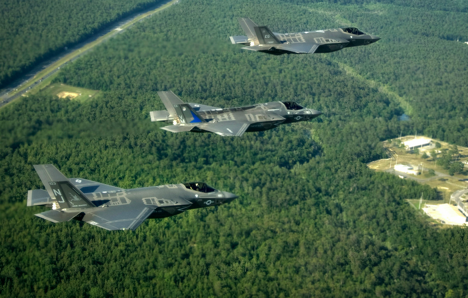 "A water engine will cut the F-35's operating costs by two-thirds," claimed CEO Bruce Fibber. Asked whether this was more snake oil Lockheed was peddling, Fibber was visibly upset and threw his microphone at the reporter and demanded to know if he was working for the Russians. “How dare you doubt my words, we are Americans, we don’t lie for no good reason,” he said. Meanwhile, there was considerable panic among America's allies such as Australia and Britain which had put all their eggs in the F-35 basket. Without fighter cover, they were left scratching their heads over how to defend their airspace. However, the Sydney Morning Herald reported that Australia did not have a single citizen having an IQ of over 110. In fact, the only person with an IQ of 110 was a 65-year-old Chinese immigrant. Efforts to enlist him in the RAAF were futile. “I told the air force chaps that I’m not suicidal; I don’t want to face the Flankers in a dogfight,” said the Melbourne resident, whose house was later tagged with racist graffiti for his refusal to sign up. Boeing would seek to produce more than 3000 of these jets for half the price of the F-35. The planes would be flown only by Boeing pilots. And if you are still here, I have some prime real estate for sale in Antarctica.